You may consider this section the, say political section or, alternatively, the speaker's corner where guest authors and the editor express their personal opinions on various subjects relating to amateur radio. The broad spectrum of topics covers the importance of the scientific method in amateur radio propagation studies, thoughts and ideas about the future of ham radio, information on VHF radio beacons in strategic positions and other subjects too. Your comments and feedback are very much appreciated, please refer to the contact section of this web site in order to submit your contribution. [April/May 2006]. Almost every day, public media reports about the signatures of the global climate change and how it affects our life, today and in the future. However, we do not yet understand the details of the geophysical processes which also includes the interaction between the lower, middle and upper atmosphere and the impact of solar-terrestrial phenomena. You and I and most of the citizens in our countries therefore expect intensified scientific efforts in this fields supported by governmental authorities. Not quite right! NASA's earth science programs getting cut (see also the below article on solar cycle predictions), NOAA plans to terminate solar wind data, Germany withdraws from the upper atmosphere EISCAT observatory in high latitudes, etc. etc. - the latest outcry originates from British scientists who are facing a brutal impact on their solar-terrestrial science programs (STP). How much science do we need in amateur radio? In the VHFDX email forum, radio amateurs have recently speculated about the possibility of terrestrial radio propagation across the Atlantic Ocean in 144 MHz. Ian, G3SEK, emphasizes the need for 'hard science in this area' to prevent radio amateurs from falling back in 'those hand-waving, amateurish Dark Ages' in which the 'most basic rules of physics' were broken by 'pseudo-science'. I asked myself, where do we meet the scientific method in ham radio and what are the complications? Vacuum tubes remain the working horses in VHF and UHF high power amplifiers. In October last year, Frisi (DF1OH) send me his idea on optimizing vacuum tubes in EME operation by using pseudorandom symmetries. Pseudorandom symmetries are well known in military radar applications since 1992 resulting in smale size radar systems. Since 2002, these radars have found its way even aboard of surveilance satellites in low-flying orbits. In his paper, Frisi concludes that pseudorandom symmetries would perfectly match the specific coding pattern in digital EME modes such as WSJT. Having discussed this opportunities with Ulli (DF1DM), we decided to build an example of a 144 MHz pseudorandom symmetry EME amplifier by using two Eimac's 8877 triodes in push-pull operation resulting in the strongest moon-echoes ever observed in an single-yagi EME QSO. Bob (ZL3NE) says: "All propagation on 6m, 2m and 70cm can be predicted before it happens, apart from Aurora and F2 all other propagation is by tropo, or weather induced!" Note that this statement also includes VHF sporadic E propagation, i.e. he interprets all sporadic E QSOs by weather phenomena too ("sporadic E no longer exists as a separete entity in my understanding", he states). Our email correspondence has started in 2000, vivid and controversial at all times but I have enjoyed it, always. I asked Bob to write a blue print paper allowing VHF radio amateurs to test his prediction method in practice. Now, you are requested to read his article, you are requested to start radio propagation predictions by using Bob's concept and you are requested to send your feedback, your comments, thoughts and ideas. Bob's guest article has caused some awareness within the ham community, see, e.g., Joe's (N6CL) review article in the CQ magazine. To document the reliability of his predictions, Bob now provides a web address where you may retrieve his latest analyses for Europe, North America and New Zealand, respectively. This article has been replaced by a detailed analysis which is now available in section 3 of this web site. By a series of fortunate circumstances we got the chance to acquire a Fairchild C-123 Provider aircraft which will open doors to new opportunities in amateur radio dxpeditions all over the world. Build in 1955, this bird was in no good shape and it was indeed a major effort to refurbish the structure and to implement modern navigation technology. The C-123 is a military transport vehicle originally used to airlift troops and cargo onto short runways and unprepared airstrips - this is exactly what we need to deploy amateur radio equipment in remote places, for example, islands which are difficult to access by boat. [April/May 2004]. The team around DL8HCZ, DF7KF, DL7AJA and DL6FAW is currently busy implementing the new EA8VHF beacon on La Palma (IL18BS). That beacon will provide 50 watts rf output into two yagi antennas beaming towards Europe and towards North America on 144.484 MHz (source: Dubus 1/2004, Funktelegramm 4/2004, personal communication). Click on the map to view the beacon's single and double hop target areas and the corresponding reflection areas in the E region of the ionosphere. In the 2004 sporadic E season, you may chase another beacon in very attractive geographical position, i.e. 5T5VHF (around 144.302 MHz, 50 W) and 5T5SIX (50.028 MHz, 15 W) in Mauretania (IK28AC). 5T2SN, DL8HCZ, DF7KF, W3CMP and DL8YHR will bring the beacon on the air this summer (source: Dubus 1/2004, Funktelegramm 4/2004 and 5/2004). Click the image to view the beacon's beamer map in single and double hop sporadic E propagation. Fellow hams in North America should also keep an eye on both beacons. EA8VHF shows a quite large target area in North America which covers in particular all territories in New Foundland and in New Scotland. Even 5T5VHF/5T5SIX is available from the most eastern tip of New Foundland (I wish the Canadian VO1ZA beacon would have a receiver module monitoring its companions on the west coast of Africa and vice versa). Thus, talking about double hop sporadic E also means talking about terrestrial transatlantic VHF propagation. It is perhaps the Dubus team that will invite all of us to this big Brendan Trophy party, who knows? 50 MHz: Thanks to the Dubus magazine, DF7KF, VP9GE, W3CMP and UKSMG we now have a beacon on Bermuda (FM72OH) operating on 50.026 MHz since August 2003. Luckily, it survived the hurricane Fabian that nevertheless destroyed the top segment of the antenna tower. Source: Dubus 4/2003. 144 MHz: The 2m equipment is already in place but not yet operational because of interference problems with an adjacent FM repeater. Source: Dubus 4/2003. "I have read with interest Dr. Volker Grassmann's article in your VHF Magazine 2-2003 edition. In that article he states that it would be desireable to have a VHF beacon on the air from eastern Newfoundland. The Marconi Radio Club of Newfoundland (MRCN) and the Baccalieu Amateur Radio Klub (BARK) are currently in the process of placing such a beacon on the air. ... The transmitter 250W PA is the same one previously used by VE1SMU beacon. The VHF exciter board and the CW ID board have been built by Joe Craig VO1NA. The 11 element Cushcraft yagi, 1/2 inch hard line and 35 amp power supply to run the beacon have been donated by Frank VO1HP. The yagi and hardline were installed by Boyd VO1CBS, Roy VO1XP and Joe VO1NA on August 30, 2003." "The beacon was placed on the air October 19, 2003 at 1330 UT. Any amateur station who claims to have heard this beacon are asked to send reports via e-mail to either vo1hp@rac.ca or vo1na@rac.ca. Please describe what you have heard and if possible the complete information being transmitted by the beacon." And this are the beacon's details: VO1ZA, 144.400 MHz, GN37JS, 2.5 kW ERP (250 W, 11el Yagi at 11m AGL and 90m ASL), 63 deg az, click here to view a photograph. Many thanks to VO1HP, VO1NA, VO1CBS, VO1XP and all fellow hams having contributed to the setup. Articles on VHF transatlantic radio propagation: . The internet service Google Earth has stimulated a surprising high public interest in satellite and aerial photography. Ordinary internet users develop into armchair 007 agents by investigating the details of confidential facilities and installations on their home computers. The British news service The Register has even launched the so-called black helicopter competition resulting in tons of photographs displaying military aircrafts, aircraft carriers and submarines all over the world. 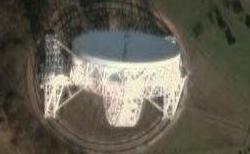 Being radio amateurs, we are however interested in satellite images of large antennas. Doing so, I have identified, for example, the Arecibo and the Effelsberg radio telecope and also the Very Large Array in New Mexico, the picture shows the Jodrell Bank radio telecope in the UK. The nihilism in amateur radio is an everyday experience: ham radio is old fashioned, has been neutralized by computer and information technology, does not provide new challenges and the establishment has lost contact to the community of radio amateurs ­ this is what hams communicate almost on an everyday basis. Amateur radio appears to be an image of our society. Opportunities in observing transatlantic VHF propagation? Having discussed possible opportunities in terrestrial transatlantic propagation on 144 MHz, Walter (NQ2O) send me the following article which suggests ocean vessels and air cargo planes as observation plattforms in amateur radio propagation studies. Difficult to realize in practice, it appears a brilliant idea though. Comparing the annual amount of dx QSO on very high frequencies, European VHF hams appear to work more are longer dx compared to North American VHF operators. Is this a real effect or are we facing accidental results? Walter, NQ2O, discusses geographical and meteorological effects and even the "American philosophy" in VHF dx-ing to explain the differences between the European and North American dx scene. Larry (VA3LK) send me this article discussing new opportunities in VHF transatlantic propagation by using modern techniques in radio beacon design. Larry is a real ham radio pioneer who has managed, together with Laurie (G3AQC), the very first transatlantic QSO on low frequencies, i.e. on 136 kHz which is certainly a highlight in amateur radio history. Larry indeed planned to "get a 144 MHz signal across the North Atlantic" but he couldn't carry out his experiments, unfortunately. On October 5, 2004 Larry passed away unexpectedly, his death is a shock to the world-wide ham community and he will be missed. This is probably the last paper he wrote. The are good reasons for ham web sites and amateur radio magazines to cooperate ... but how? [June 2004]. In the late seventies, I subscribed to the Dubus magazine because I was pretty much impressed by the VHF ham community, by its dx propagation tests, its analyses, studies and projects and even today, I refer to this magazine to access observation material compiled by VHF radio amateurs more than twenty years ago. Nowadays, many ham sites are available in the internet dealing with VHF radio propagation but I am in doubt that all this internet resources can provide the same level of continuity compared to print media. In 2024, you may find the 2004 issues of Dubus in your book-shelf, but the 2004 issues of this web site will be forgotten, definitely. Nevertheless, the internet puts significant pressure on all print media in ham radio. Sometimes I feel guilty operating a web site rather than placing all contributions in ham radio magazines (okay, some of my articles are published in Dubus prior to its publication here but this doesn't count, actually). I consider magazines and web sites different types of communication platforms with different style, different flavour and different attitude without substituting each other. However, both platforms share identical objectives, i.e. promoting ham radio, stimulating thoughts and discussions and attracting the interest of potential newcomers. Thus, there are good reasons for cooperation but how does this cooperation look like in practice? Concepts are not yet available, unfortunately. Published in Dubus, 3, p114, 2004. Do you hate this spam messages disturbing the dx cluster spot lists? I do. Distributing chat messages, useless announcements and notifications, online greetings and salutations and, most annoying, automated messages in the dx cluster is bad style, in my view. As a result of all this spam messages, VHF dxers start ignoring the dx cluster which means: this operators stop sending dx information into the cluster. This consequence is quite damaging to the dxc service, in fact. Where does this spam problem come from? Is there anything we can do against it? Yes we can and the answer is quite simple, perhaps. Very few organisations operate a world-wide data network which communicates realtime data, which records all information for later retrieval, which triggers alerting services and which may be accessed by any user in almost any place in the world free of charge. Radio amateurs own this type of network, i.e. the dx cluster (dxc) network. The dx cluster represents a permanent dx monitoring system between 1.8 MHz and 10 GHz that operates 24 hours per day and 365 days per year on a world-wide basis. We may speculate that the dx cluster tracks the majority of dx openings in the world, i.e. its data base reflects almost all elements in terrestrial radiowave propagation. From this perspective, the dx cluster data must be considered a treasure which can support radio propagation studies in various aspects. However, raising the treasure is difficult because the dxc is designed for humans reading the data but ignores the requirements for electronic data processing. Starting a CQ call is more than pressing the PTT button on your microphone because you have to find a clear frequency to launch the call. Which one? You may argue this is no significant question because any clear frequency is a good frequency. Not quite right when analysing the frequency distribution of amateur radio stations in the 50 MHz band. Als Student ist man ja angeblich stets etwas kritischer und so engagierte ich mich vor vielen Jahren vorübergehend in der "Amateurfunkpolitik" - nein, nicht als Funktionär, sondern eher als "Amateurfunkbürger". Durch Zufall erhielt ich die Kopie einer strengen Verwarnung des DARC e.V. durch das damalige Fernmeldetechnische Zentralamt der DBP, woran man erkennen kann, dass sich dieser Vorgang vor sehr langer Zeit ereignete. Meine schriftliche Anfrage beim DARC e.V. über den Hergang dieser Angelegenheit offenbarte allerlei Vertuschungsversuche seitens der damals Verantwortlichen (die nicht ahnten, dass ich über den genauen Hergang bereits bestens informiert war), Leserbriefe an das Vereinsmagazin cq-DL wurden auf groteske Weise zensiert und inhaltlich verfälscht und die DARC-Funktionäre versuchten angestrengt, die kritischen Anfrager (inzwischen waren auch andere Funkamateure auf die seltsamen Vorgänge aufmerksam geworden) zum Schweigen zu bringen. In meinen Augen widersprach das Gebahren des DARC e.V. meinem Demokratieverständnis, weshalb mir ein Verbleib im Verein unerträglich erschien. Naja, seither ist eine lange Zeit verstrichen und ich vermag nicht zu beurteilen, ob sich der heutige DARC e.V. weiterhin als "Amateurfunker-Regierung" versteht und den Belangen des UKW-Amateurfunks noch immer eher desinteressiert gegenüber steht - ich habe ihn einfach aus den Augen verloren. Ich kann nicht erkennen, dass dies meine Möglichkeiten im Amateurfunk in irgendeiner Weise beeinträchtigt hätte.